You can create an alias of a file to serve as a shortcut for finding it, no matter where it’s buried on your Mac. When you create an alias, you’re not making a full duplicate of a file. (If you want to create a full duplicate, press Command+D or choose the commands File and then Duplicate.) Instead, you are effectively copying the file’s icon, not the file itself, meaning that you are barely using any disk space. Clicking an alias icon summons the original file no matter where it’s located on the computer — even if you’ve renamed the file. You may want to create an alias for a file that you could easily justify putting in any number of folders. Because the Mac lets you create multiple aliases, you can effectively place the file in each of those folders (even though it really resides in only one place). To create an alias, highlight the original icon and press Command+L or choose File and then Make Alias. You can also drag an icon out of its file window or to another location inside the window while you hold down the Option and Command keys. 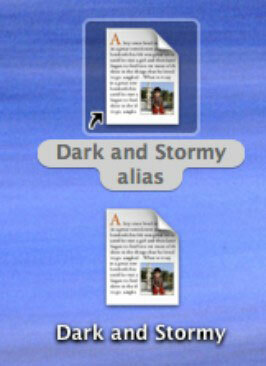 The alias looks like a clone of the original icon, except the alias suffix is added to its name and a tiny arrow appears in the lower-left corner of the icon. Clicking either brings up the same file. If you want to find the location of the original file, highlight the alias icon and choose File and then Show Original. To get rid of an alias, drag it to the trash. Doing so does not delete the original file. If you had separately deleted the original file, the alias can’t bring it back. But you can link the alias to a new file on the machine.